Gathered around the kitchen table in the Highland Road home in Baton Rouge where they grew up, sisters Margie Harelson Windham, Janice Harelson Troxclair, Dottie Harelson Territo and Catherine Harelson Palermo talked about their years at St. George School in Baton Rouge. Windham was in the first graduating class at St. George, which added more grades each year. And, each year, another member of the Harelson household, which included 10 children, would be added to the student roll, something that continues even today. In a nearby recliner, their mother, 97-year-old Erin Ory Harelson, listened and added her own memories. Sacramental records from the Archives Department at the Diocese of Baton Rouge indicate a long history of the Harelson and Ory families in the St. George parish area. St. George was a mission chapel of St. Joseph Cathedral and included a school, where Leontine Cannon taught after graduating from St. Joseph’s Academy in 1887, according to records. 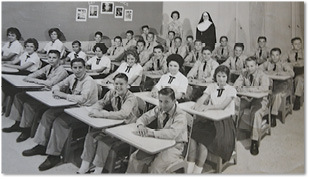 St. George’s Blessed Child of Mary School is listed only a few times in records from 1890 – 1913. Meanwhile, St. George Church was established in 1908. As the city of Baton Rouge grew, so did the area around the church. But, it would take another half century for the school to be established, which happened in 1960 thanks to the efforts of Father James Finnegan, then pastor of St. George. “When I went to St. George (school), it was gravel; there weren’t even paved roads,” said Windham, who rode the bus to school. Erin Harelson and her late husband, William, raised their family, which included eight girls and two boys, on several acres on Highland Road in an area that was once considered rural. 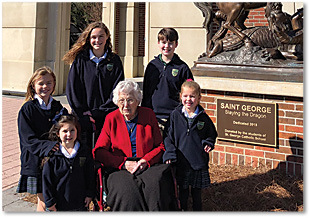 As St. George School added more grades, more of the Harelson children became students. Father Finnegan, who was pastor of St. George for 15 years, also became a close friend of the family, with Harelson even doing some of his grocery shopping. Father Finnegan, known for carrying peppermints, would sometimes drive to the Harelson home just to shower the children with candy. In all, there were 10 Harelson children, nine grandchildren and eight great grandchildren. Currently, five great grandchildren are students in grades pre-K through eighth: Kate Palermo, Ashlynn Troxclair, Avery Troxclair, Jordan Territo and Brendan Levins. With so many students in her family, Harelson has been to lots of school functions including ballgames, plays, concerts, school Masses and, of course, Grandparents’ Day. “I’ve been to quite a few, quite a few,” Harelson recalled. Changes in the city’s landscape also meant changes for the church parish and school. Better roads and easier modes of transportation have helped St. George grow into one of the largest churches and schools in the diocese. And, that’s great news – because it looks like more Harelson great grandchildren, and descendants of the school’s first teacher, are on the way.